Type: Art & Antiques, For Sale - Private. EVERLAST Forged Aluminum LAZY SUSAN with a 3-section Relish/Condiment Dish in the Center, this WONDERFUL PIECE is from the 1940's or thereabouts, Top is approx 15" in diameter, the Pedestal stands approx 4'' tall and has perfectly working Ball Bearings that the top tray spins on, the Tray has a DEER or ANTELOPE scene pressed right into the Aluminum, the Glass relish dish in the center is approx 5'' in diameter and ALSO HAS THE ALUMINUM LID, has a makers mark on the bottom ''EVERLAST FORGED ALUMINUM 5048'', This is a REALLY NICE PIECE and in Nice Condition!! SACRIFICED at $35 and YOU KNOW that's a DEAL! THANKS! Pick-up at my HOME in Lecanto! Thanks! Check MY OTHER ADs by CLICKING on the ''VIEW ALL ADS'' Button on the upper right of this page and YOU Might Be Surprised at What YOU Find! EVERLAST Forged Aluminum LAZY SUSAN with Relish Dish OLD $30 NOW! 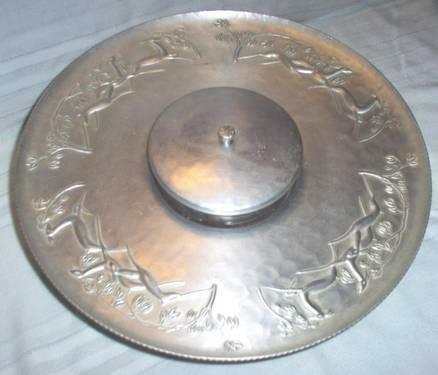 EVERLAST Forged Aluminum LAZY SUSAN with Relish Dish VINTAGE! !